Internet Broadcasting! With the Internet becoming the television transmitter for all of us, now ATEM Television Studio lets you do live production and simultaneously generate H.264 files for the web, all in real time. The moment your event is finished, your encoded file is ready for distribution! Imagine covering events that previously could never justify the cost of a professional multi-camera production, such as local government meetings, school productions, local sports, car racing, concerts, weddings, bands, communities, air shows and many more! Built to Perform ATEM Television Studio might be small, but it's packed with professional power! ATEM includes all the same features as the most powerful switchers used in broadcast, and is not "dumbed down." This means you get professional results, and a familiar M/E style of operation. 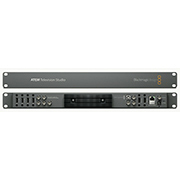 ATEM is affordably priced because you can get started with only the switcher chassis and a software based control panel! Then when it's time to add dedicated hardware control, you get only the best because ATEM uses premium quality switches, faders and joysticks that are normally only found on the most expensive switchers available. ATEM even uses an FAA certified operating system for a true broadcast grade switcher! Software Control Panel For the ultimate in portability, every ATEM production switcher includes a beautifully designed software control panel so you can use your switcher from your Mac or PC laptop! Only ATEM lets you start at a lower cost because you are not forced to buy a control panel! Read more > Built in H.264 Encoding! The Internet is becoming the television transmitter for all of us, and ATEM Television Studio is more than a live production switcher, it's also an encoder! You get production as well as distribution technology all packed into an incredibly portable 1 rack unit size! Read more > More Connections ATEM Television Studio is a professional broadcast SDI switcher that also includes loads of HDMI connections so you can start affordably with consumer HDMI cameras. Unlike other switchers, every single video input features an automatic frame re-synchronizer, so you can plug in any device and it always works! Read more > Creative Power ATEM is the most creative solution for live switching! All transitions are instantly available and include the same cut, mix and wipe found on traditional mixers! It's simple to load graphics into the 2 built in media player frame-stores for exciting custom titles and logos! If you're doing green screen shoots, then the ATEM keyer includes full chroma keying! Imagine loading a rendered background and using the chroma keyer for an affordable virtual set! ATEM Television Studio also includes 2 downstream keyers so you can add graphics such as "live" and "replay"! You get professional results with ATEM! Multi View Monitoring Now you can save thousands of dollars on camera monitoring with ATEM's built in multi view. Multi view allows 10 channels of video to be displayed on a single HDMI television or monitor. You can also customize labels and set safe area markers on the preview display. Multi view includes tally so on-air sources have red borders and preview sources have green borders. ATEM multi view is as simple to use as connecting a single HDMI monitor, so you get the perfect portable solution! Premium Quality For the highest quality video with extremely low processing delay, ATEM features a fully 10 bit digital design. This means you get the highest quality available from cameras, servers and character generators with true 10 bit video quality maintained throughout the entire signal path. Get better chroma keying and seamless layering from HDMI and SDI sources so all your video maintains that pristine broadcast quality look! Incredible Features You simply get more features with ATEM! You get an upstream keyer, with chroma, pattern, shaped and linear keying. You also get 2 downstream keyers and independent fade to black. This powerful feature set means you can produce true professional broadcast style live productions! When you're on the move, the built in multi view monitoring totally eliminates monitoring costs! Nothing beats ATEM for creative features, quality and affordability!